It’s already Monday again, so I thought I’d start the week off with a yummy cookie recipe . 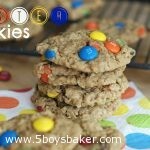 . . monster cookies in fact! Monster cookies are nothing new, in fact I’m pretty sure they’ve been around for quite while since the recipe book I got the recipe from was given to me as a wedding shower gift 23 years ago. If I had to guess, I’d say they’ve probably been around even longer than that. Monster cookies are pretty dang awesome if you ask me. They require no flour which is great if you need to go gluten free. 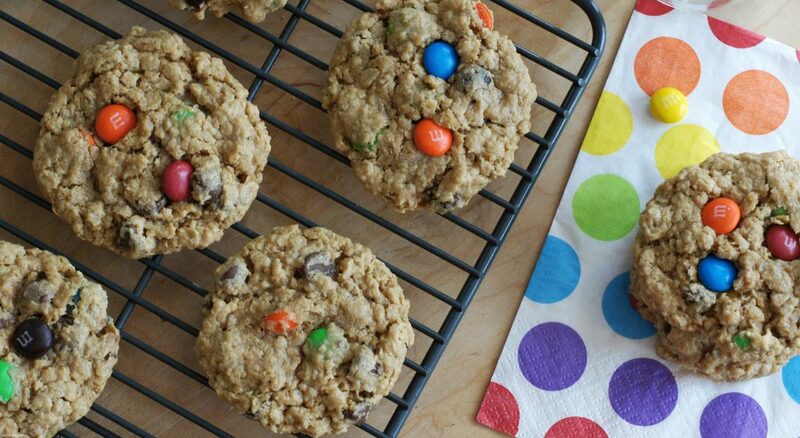 They are chock full of peanut butter, oatmeal, M&M’s and chocolate chips — does a cookie get any better than that? The dough is delicious and the cookies are equally delicious. These were a huge hit when I made them. I managed to stash a few in the freezer before my boys devoured them. Feel free to add more M&M’s or chocolate chips if you want. You could even live a little on the wild side and throw in whatever you want. . .peanut butter chips, butterscotch chips, craisins, Rice Krispies, etc. Preheat oven to 350°F. Spray cookie sheet with nonstick spray, or line with parchment paper or a silpat liner. In a large bowl, combine the peanut butter with the sugars and butter. Use an electric mixer to mix until well combined. Mix in the eggs and vanilla. Add the oats and baking soda and mix until well combined. Stir in the chips and M&M's. Drop the cookies by heaping spoonfuls onto the prepared cookie sheets. These cookies freeze really well.